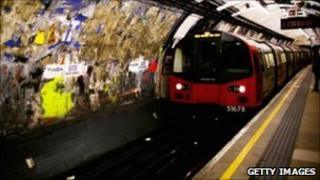 Image caption Tube bosses said the strike was "pointless" but the RMT claimed a member had faced "victimisation"
London Underground (LU) has warned it will run services on only part of the Bakerloo Line on Saturday, owing to a 24-hour strike by crews at two depots. Rail, Maritime and Transport (RMT) union members walked out at 2100 GMT on Friday over disciplinary action for one colleague and the dismissal of another. LU said it planned no trains north of Queen's Park but would add more stations if staff became available. A Northern Line depot is also affected but a normal timetable is scheduled. LU said the industrial action was "pointless" and the RMT was "showing utter contempt for Londoners". It also said the member of staff who was dismissed had been responsible for "a serious breach of safety rules". But last week RMT general secretary Bob Crow said it was a case of "victimisation on the grounds of trade union activity".